Serious English colonial competition for mainland North America did not begin until the 1607 establishment of Jamestown and the Virginia colony (Raleigh’s colony at Roanoke in the 1580s was a failure). Although permanent Spanish occupation in St. Augustine predated Jamestown by 42 years (some two generations), the early success and growth of Virginia ultimately exerted competetive pressure on the Florida colony. By the time of the foundation of Charles Town and the Carolina colony in 1670, Spanish Florida was already in active retreat from English aggression, and by the end of 1706 the once-expansive Spanish mission system (effectively constituting Spain’s only direct control of the coastlines and interior around St. Augustine) had been reduced to ashes by direct English assault. The region now called Georgia ultimately became an early battleground for English-Spanish colonial border wars, and was transformed into a sparsely-populated buffer-zone by the time of Oglethorpe’s arrival in 1733. Without any question, the most insidious (and successful) component of late 17th- and early 18th-century English colonial expansion was the Indian slave trade. Using allied Indian groups such as the Creek, Cherokee, Chicasaw, and others, the English armed their own partisans in order to conduct raids against unallied or enemy groups (particularly those under Spanish or French control) and capture living Indians for enslavement and sale to English traders. Early 18th-century Carolina records contain an abundance of references to the purchase and sale of Indian slaves, and regulatory codes governing the slave trade consistently make note of the official government policy of protecting English-allied Indians from enslavement (explicitly leaving unallied Indians free for the taking). Adult Indian males were specifically excluded from purchase, and young boys, girls, and adult women were branded to mark their ownership. For this purpose, iron brands were routinely dispatched to traders among the Cherokees and others in order to “mark all skins, furrs, and slaves bought.” Despite the cruelties of this early commerce, English explorer and trader Thomas Nairne commented in 1708 regarding the Indian slave trade that “it is a more effectuall way of civilising and instructing than all the efforts used by the French missionaries” (English-allied Creeks had destroyed the last frontier Spanish missions in 1706, leaving only the French far to the west). During the decades around the turn of the 18th century, surviving Georgia Indians thus had only two choices — ally themselves with the English as slave-raiders and deer hunters, or seek the protection of the Spanish missions in hopes of avoiding capture and sale as slaves. Flight and isolation was not a viable option; by 1708, Nairne reported that Creek and Chickasaw slavers were forced to raid all the way down to the Florida Keys in order to find fresh victims, since the entire Florida peninsula (apart from the refugee missions around St. Augustine) had been completely depopulated by slaving. Survival in what is now the state of Georgia during the early 18th century meant becoming a voluntary paricipant in the Carolina slave trade. Following the final Spanish evacuation from the Georgia coast in 1684, and from western Georgia in 1691, the only major surviving Indian groups in Georgia were the Creek and Cherokee (along with smaller groups such as the Yamassee and immigrant Savannah), and all of these groups acted as slave-raiders for the English. Only when there were too few Indians left to be captured did the deerskin trade finally replace the Indian slave trade. The chronology below lists key dates in the English conquest of Spanish Georgia, including not only those events that occurred directly within the state, but also other events that had significant bearing on the eventual creation of the Carolina-Florida buffer-zone, which James Oglethorpe ultimately settled and fortified as the colony of Georgia. As should be obvious, the famous 1742 “Battle of Bloody Marsh” only served as the capstone in an extended military campaign that had lasted nearly a century. 1624-28 Rumors of white horsemen along the northern Florida frontier prompt at least five unsuccessful Spanish reconnaissance expeditions into the Georgia interior in search of Englishmen operating out of Virginia. 1659 English-armed Indians from the Virginia frontier, variously called Ricahecrian, Chichimeco, or Westo, assault surviving indigenous groups in the Georgia interior in search of slaves for sale to English traders; Indian fugitives begin to flood into the Spanish mission frontier. 1661 The Chichimeco/Westo descend the Altamaha River to launch a surprise-attack on mission Santo Domingo de Talaje (near present-day Darien); following the mission’s destruction, its survivors relocate the town to St. Simons Island. 1663 Chichimeco/Westo Indians reported to have settled on the Savannah River (near present-day Augusta); immigrant refugee towns along the northern Georgia and southern South Carolina coast are now known collectively as the Yamassee. 1666 An English expedition from Barbados under Robert Sandford lands in the area around Port Royal along the lower South Carolina coast, leaving surgeon Dr. Henry Woodward in the Yamassee town at Santa Elena in anticipation of a return voyage the following year. 1667 Following continual slave-raids by the Chichimeco/Westo, Yamassee chiefs under the chief of Santa Elena successfully petition the governor of Spanish Florida for permission to settle among the Guale and Mocama missions of the Georgia coast; Englishman Henry Woodward is turned over to the Spanish (he later escaped when an English pirate burned St. Augustine in 1668). 1670 Charles Town founded as the capitol of the new English colony of Carolina; Spaniards attempt an unsuccessful assault on the new colony using Spanish soldiers and Guale Indians. 1671-72 A permanent Spanish garrison with a lieutenant and a dozen soldiers is placed in mission Santa Catalina de Guale on St. Catherines Island as mainland missions are withdrawn southward and seaward. 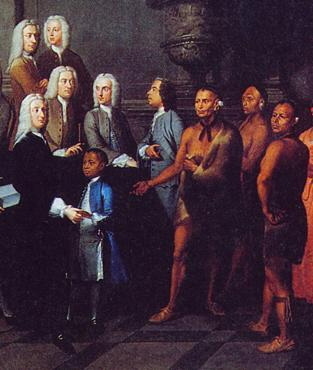 1674 Carolina colonist Dr. Henry Woodward successfully negotiates trade relations with the Westo along the Savannah River; Carolina replaces Virginia as the primary market for Georgia Indian slaves. 1680 Carolina colonists led by Henry Woodward mount a combined raid against the Georgia missions using Westo/Chichimeco and other allied Indians (the Uchise of central Georgia and the Chiluque of the South Carolina coast); led by Englishmen, some 300 warriors first assault the Yamassee town of San Simón on present-day St. Simons Island before withdrawing to attack the Guale capitol at mission Santa Catalina de Guale on St. Catherines Island; Santa Catalina is abandoned and withdrawn to Sapelo Island. 1681 Carolina colonists destroy the aggressive Westo and replace them with the immigrant Savannah Indians (Shawnee), whose town near present-day Augusta soon becomes the hub of Carolina trade into the western interior (also lending its name to the Savannah River). 1683 French and English pirates under the Monsieur de Grammont attack and plunder Spanish missions on present-day Cumberland Island; Yamassee immigrants under Chief Altamaha withdraw from Spanish territory to resettle in the Carolina-Florida hinterland at Hilton Head Island. 1684 English pirates operating out of Charles Town destroy all remaining Spanish missions on the Georgia coast; surviving missions are relocated to Amelia Island and southward, incidentally forming the present-day boundary between Georgia and Florida at the St. Marys River. 1684-86 The newly-established Scottish colony of Stuarts Town on the lower Carolina coast forms an alliance with nearby Yamassees under Chief Altamaha, providing guns and cutlasses for a 1685 slave-raid across Georgia and deep into northern Florida; mission Santa Catalina de Ajoica is laid waste, and 21 Christian Timucuans are brought back to Carolina for sale as slaves; Spanish-Guale reprisals in 1686 result in the destruction of Stuarts Town and new Yamassee settlements on newly-abandoned St. Catherines and Sapelo Islands. 1685-86 Using Yamassee intermediaries, Carolina traders under Henry Woodward finally establish trade contact with the Coweta/Kasihta (the Apalachicola province, or emergent Lower Creek) of the lower Chattahoochee River in western Georgia; Spanish reprisals under Antonio Matheos in the Apalachee mission province result in the destruction of four towns. 1689-91 A Spanish fort is constructed and garrisoned in the heart of Apalachicola province on the Alabama side of the lower Chattahoochee River; most English-allied towns under Coweta/Kasihta move eastward to trade with the English on the Ocmulgee River (called Uchise Creek); the Apalachicola fort is finally abandoned in 1691. 1690 Carolina colonist James Moore journeys up the Savannah River into Cherokee country, crossing the Appalachian summit for the first time; the Cherokee trade flourishes in subsequent years. 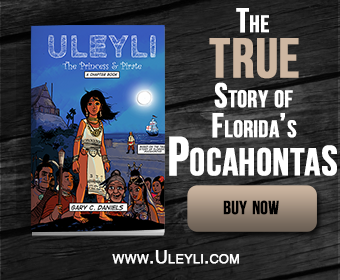 1691 English-allied Uchise Creek Indians assault and destroy mission San Juan de Guacara on the Suwannee River in Florida. 1702 English-allied Uchise Creek Indians assault mission Santa Fé de Teleco in north-central Florida; a massive retaliatory strike by 800 Christian Indians under Spanish direction is ambushed along the lower Flint River in southwestern Georgia, where half of the Spanish force is killed. 1702 Carolina Governor James Moore traverses the Georgia coast to mount a land and sea assault on St. Augustine and its northernmost missions; St. Augustine is burned to the ground along with all remaining Guale and Mocama refugee missions. 1704 Governor Moore finances a massive expedition against the Apalachee mission province of northwest Florida; using Uchise Creek allies staged at Ocmulgee town in central Georgia, combined English-Indian forces annihilate the missions, torturing, killing, and enslaving hundreds of Christian Apalachee for sale in Carolina; other Apalachees agree to relocate freely to the Carolina frontier along the Savannah River. 1705-06 Continued English-sponsored Indian raids launched in Georgia result in the destruction and withdrawal of all remaining Timucuan and Apalachee missions to the fort at St. Augustine. 1715-16 In response to increasingly abusive practices by Carolina traders, Yamassee and Creek Indians spearhead a massive and widespread revolt against the English, murdering traders and settlers across the deep frontier; a Carolina expedition to Cherokee country confirms their alliance with the Carolinans, crystallized by the murder of a party of Creeks at the town of Tugalo on the upper Savannah River; all Uchise Creek towns return west to the lower Chattahoochee River in western Georgia, while the Yamassee flee south to the missions around St. Augustine. 1721-27 In anticipation of French penetration of the frontier from the west, John Barnwell constructs a garrisoned Carolina military outpost called Fort King George on the ruins of 17th-century mission Santo Domingo de Talaje at the mouth of the Altamaha River; following years of diplomatic disputes with the Spanish, the fort is finally abandoned after only six years. 1728 Carolina Colonel John Palmer leads English and Indian raiders across the Georgia frontier on an assault against Yamassee and Mocama missions around St. Augustine. 1733 James Edward Oglethorpe founds the city of Savannah and the English colony of Georgia; the 1736 construction of fortifications on St. Simons and Cumberland Islands, and a failed 1742 Spanish retaliatory invasion, ultimately establishes the Georgia coast as English territory.